Highrise has entered the Entertainment Industry, supplying platforms for marquees and stages, safety railings, stairs and access ramps and various other services for numerous special occasions and sporting events. 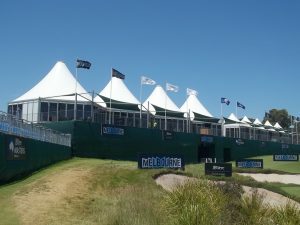 Highrise have supplied their services to some of the biggest events including the Master Card Masters Golf Tournaments and the Australian Open Tennis Events. Steve Allen brings to the company many years of experience and expertise in the industry, overseeing scaffolding requirements at all the major events such as the Grand Prix, Golf Events, The Melbourne Cup, Caulfield Cup, Cox Plate and numerous other events including some of the biggest weddings and parties in victoria. Weddings Marquees, Platforms, Safety Railings, Stairs and Walkways, Viewing Platforms, Fall Protection, Stage Platforms and more, contact Highrise today to discuss your next special event. 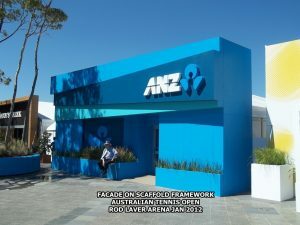 Highrise supplied their services to the Australian Open at the Rod Laver Arena in January 2012. Highrise provided their services for the Masters Golf Tournament in 2011.